Canon has waited almost three years to update its enthusiast range of D-SLRs – a long time in the photographic world – and as such the recently-released EOS 70D leaps beyond its predecessor in terms of its features and capability. It’s aimed at photographers who are already familiar with D-SLRs, but want to take the next step up in their controls and creativity. The 70D comes in to replace 2010’s 60D, which will eventually be phased out, but for now they sit beside one another in the EOS range. Technology has raced ahead over the past three years, so a direct comparison between the two cameras wouldn’t be fair, but what does the new model offer? In the time that’s passed since Canon released its last enthusiast D-SLR, the company’s engineers have clearly been very busy. The EOS 70D comes with a brand-new and potentially revolutionary sensor; the 20.2Mp APS-C CMOS chip not only packs more pixels than its predecessor, but it’s the first camera to feature Canon’s Dual Pixel CMOS AF technology. This Dual Pixel technology means that each pixel features two separate photodiodes that gather light to assist with even faster autofocusing, particularly when using Live View or video mode. Although the data from each pixel leaves the chip as one piece of information, by splitting the way the light enters each diode it allows the camera to intelligently assess the difference in light waves entering each photosite to quickly adjust the lens to accurately focus. The focusing itself sports a 19-point AF system with all points the more accurate cross-type, just as can be found on the EOS 7D. Alongside this groundbreaking sensor, the EOS 70D features the DIGIC 5+ image processor; the same one found in Canon’s top-of-the-range EOS-1D X and 5D Mark III cameras. This powerful processor offers 7fps continuous shooting at full resolution, and an ISO range of 100-12,800, which can be expanded to 25,600 for faster shutter speeds in low-light conditions. When shooting video however, which can be captured in full HD (1920x1080 at 30fps), the ISO’s upper range is limited to a respectable 6400. Curiously, Canon has omitted a headphone socket; so despite advancing the video function by introducing a smart new focusing system – you can’t monitor audio in capture. 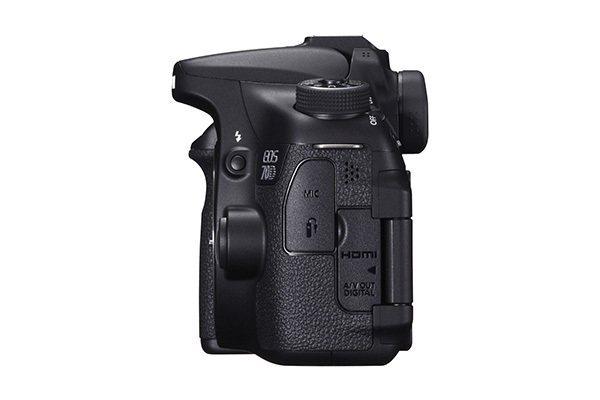 The 70D also comes with a 3.0in Vari-angle touchscreen – the first time such a feature has been included on a more advanced enthusiast Canon D-SLR. The monitor can flip away and rotate from the camera body on an articulated joint to help you compose your shots from awkward angles. The touch feature means you can quickly access controls and menus – as well as flick through your pics – much more conveniently. Another contemporary feature is the inclusion of Wi-Fi, so you can share your images with other devices, as well as control your camera remotely with an App on a smartphone or tablet – great news if you want to shoot wildlife without spooking it. Alongside this, the 70D comes with a range of creative filters to apply artistic effects, as well as in-camera RAW processing. The 70D looks and feels like a serious bit of photographic kit. It sits very comfortably in the hand and the protruding grip with a textured, rubberised finish ensures it’s unlikely to slip. For its size it’s reasonably light, thanks to the use of aluminium and polycarbonate resin in the construction, which weighs less than heavier magnesium alloys. On the left of the top-plate is a Mode dial which houses a couple of Auto modes as well as the usual M, Av, Tv, P modes, and this is one of the few indications that this is an enthusiast camera rather than a fully pro model. On the right of the top-plate is an LCD display giving shooting info, and a row of buttons to switch parameters such as ISO or Drive modes. In full Manual mode the Shutter speed is controlled with a dial on the top-plate, and the Aperture is adjusted with a command dial on the rear; or in any of the other creative modes this rear command dial is used to adjust Exposure Compensation – which makes it quick and easy to adjust the brightness of your shots. Overall, the buttons and controls are intuitively laid out. Operating the camera is made even easier with the inclusion of the large vari-angle touchscreen. This is very responsive, and one press of the Quick Menu button brings up an array of on-screen commands which can be adjusted with a tap and swipe of a finger, meaning there’s no need to trawl through long and complicated menu lists. When using the screen for Live View, images are bright and sharp, and the ability to rotate the screen out from the body makes it even easier to compose your shots from unusual angles. Focusing during Live View is fast, and the AF point can be set by tapping the screen. The benefits of the Dual Pixel chip are obvious, too – the focus never went hunting, even in low-light situations. AF was even faster when using the large, bright viewfinder and we managed to lock focus on most subjects almost instantaneously. The Digic 5+ processor also impressed; we rattled off a burst of over 750 Large Fine JPEGs, and there was no drop-off in pace as the buffer never filled. When shooting RAW, the engine could handle a burst of 18 files, and these took 12.6secs to be recorded to our test card. A single Jpeg was saved in 0.8secs and a solitary RAW file took 1.2secs to be written to our card. The Canon EOS 70D is currently priced at £1079 for the body only (£1199 with the 18-55mm kit lens), which could be seen as expensive for an enthusiast D-SLR, especially when you consider its predecessor – the 60D – is available for £548. Once you take into account the number of extra features this camera offers over the 60D, such as the Dual Pixel sensor, the improved processor and the touchscreen, you begin to see the justification for the price tag, and it’ll begin to drop over the coming months as retailer discounting starts to kick in. Another option to consider for a similar spec camera is the Nikon D7100 which has a higher pixel count at 24.1Mp, but lacks some of the modern features like Wi-Fi or a touchscreen – and it currently retails for less at around £840. That said, if you’re already a Canon user, you’d be unlikely to make the switch especially if you’ve invested in a number of lenses. All things taken into account, the 70D is an excellent camera, and its value for money will only increase over the coming months as its launch price drops. The latest EOS from Canon has been a few years in the making, but we’re sure Canon users will agree it’s been worth the wait. This model incorporates lots of contemporary technology such as Wi-Fi and touchscreen operation, as well as unveiling brand-new features like the Dual Pixel sensor, which provides even faster AF during Live View/video capture. Quite frankly, this camera raises the bar for the more serious enthusiast, and will take some beating. This review was first published in the November 2013 issue of Digital Photo - download back issues here.